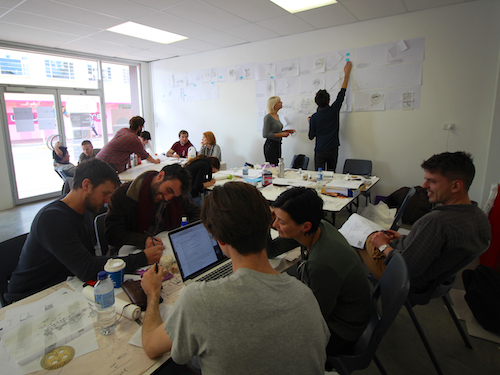 Returning from a two-week design studio focusing on the essential infrastructure needs of Indigenous communities in central Australia, University of Newcastle architecture students have learned there is more to architecture than simply designing buildings. It is about collaboratively creating new places and spaces, and engaging with the lives of the people who will use and occupy them. 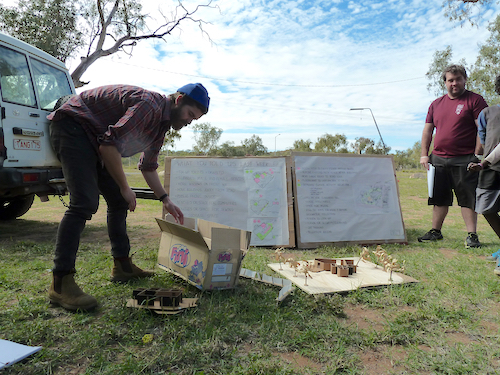 The talented group of students worked closely with local architectural practice Tangentyere Design and its parent organisation Tangentyere Council to craft creative, practicable proposals for much-needed small and large infrastructure in the Alice Springs Town Camps. Four projects looking at community centres and basic accessibility issues were developed with residents at Ilperle Tyathe (Warlpiri), Anthelk-Ewlpaye (Charles Creek), Karnte, Ilparpa and Inarlenge (Little Sisters). “These are important projects that Town Camp residents have long identified as priorities for their communities,” said manager of Tangentyere Design, Andrew Broffman. Third-year Jessica Maher was one of 14 undergraduate students from the University of Newcastle to travel to Alice Springs in July, assigned to collaborate with 3 others to help develop responses to the accessibility challenges faced by Town Camp residents on a daily basis. “We visited several homes, walking through each and speaking directly with the owners and other local residents about how they go about doing their washing, going to the toilet and other day-to-day activities,” she explained. Adding that “everyone deserves the same experience from architecture,” Maher said she believes it’s been only very recently that the discipline had begun to consider equality and disabled access. Echoing these sentiments, fifth-year student and fellow project participant Thomas Studholme also acknowledged that as much as architectural practice continues to change in response to new technologies and influences, its essential nature and purpose remains unchanged. “Clean water, sunlight, accessibility, functionality and good structural design are still the most important considerations when designing buildings within marginalised communities,” he said. Maher and Studholme joined 12 other students at an exhibition on Tuesday 16th August to share the work that was produced in Alice Springs. Their efforts represent significant first steps to seeing old buildings once again become active community spaces. Importantly, the focus on accessibility has inspired the development of an invaluable tool to advocate for the accessibility needs of Town Camp residents around their own homes and neighbourhoods. 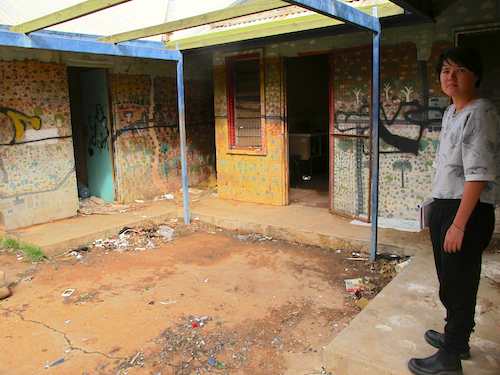 “The demands on small practice limit the opportunities for architects to actively champion the many pressing issues faced by Aboriginal people in remote and urban town camp communities,” Broffman said.